Handout received on March 20, 2013 from the Asian Tour shows Luke Donald of England at the Kuala Lumpur Golf and Country Club. World number three Donald crashed out in the Maybank Malaysia Open on Saturday as rain chaos forced organisers to slash the event to 54 holes with Thailand’s Kiradech Aphibarnrat in the lead. World number three Luke Donald crashed out in the Maybank Malaysia Open on Saturday as rain chaos forced organisers to slash the event to 54 holes with Thailand’s Kiradech Aphibarnrat in the lead. Donald missed the cut in a regular European Tour event for the first time in his professional career, but quickly pushed aside fears that the poor outing here would damage his prospects for next month’s Masters Tournament. 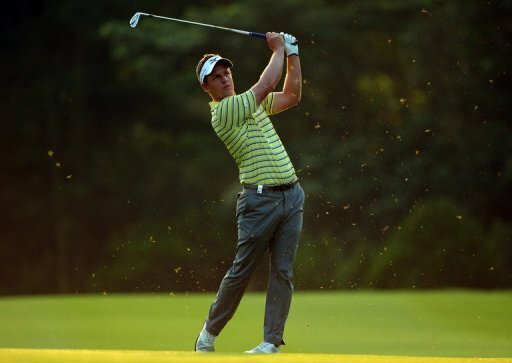 The Englishman posted rounds of 74 and 73 at Kuala Lumpur Golf and Country Club for a three over par total — three off the cut mark — and was uncharacteristically out of form with the putter. With the Masters Tournament just under three weeks away though, Donald said he was confident he can sharpen up in time as he goes in search of his first Major title. “I’ve got a couple of weeks off to get ready for Augusta and I’ll obviously be very diligent in my preparation,” the 35-year-old former world number one said. Meanwhile, big-hitting Kiradech increased his lead to two shots as the second round of the $2.75 million tournament was completed in another rain-soaked day. Kiradech already one clear of the clubhouse leaders — South Africa’s Charl Schwartzel and Ashun Wu of China — after a front nine 33 on Friday, started with eight pars before finishing with a birdie at the 18th after a glorious wedge to three feet. That gave the Thai a four under 68 and 11 under par halfway total. Schwartzel and Wu were joined in second place by France’s Grégory Bourdy and Australian Wade Ormsby, who went round in 69 and 65 respectively at the end of round two. Two time Major winner Padraig Harrington is also in the title mix as he closed with a 68 to add to his opening round 69 and was seven under heading into the third round. Organisers Saturday decided that the tournament would be played over 54-holes and play would resume early Sunday. Thunderstorms had brought play to an early close on Thursday and Friday, leaving half the field to return early on Saturday to complete their second round. The third round got underway late afternoon but was soon halted due to more storms. Most of the players were on the front nine holes when play was suspended.